The New Humanitarian | How best to save the Dead Sea? 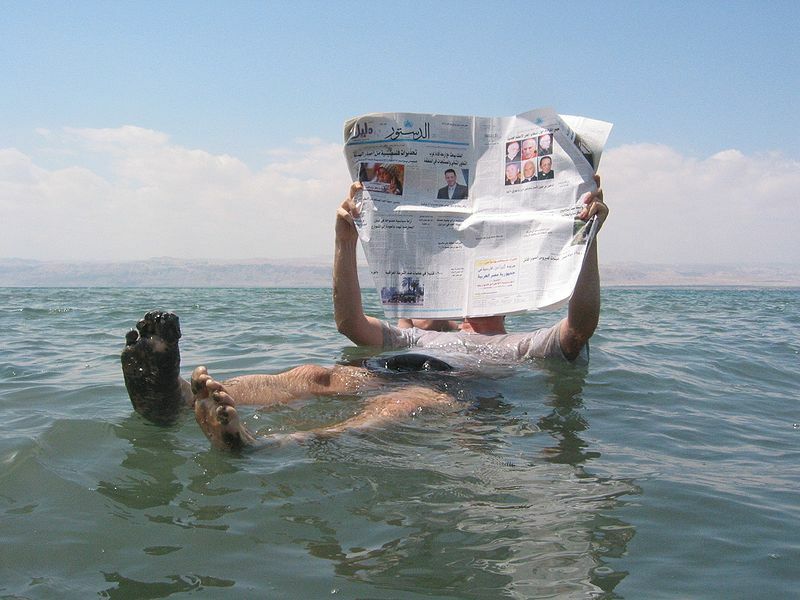 How best to save the Dead Sea? Jordan's plan to save the shrinking Dead Sea by channelling more water to it from the Red Sea could have a detrimental environmental impact, environmentalists have warned. However, not doing anything could lead to an environmental, economic and human catastrophe, say experts. Two water-related projects are currently being proposed in Jordan: the Red Sea-Dead Sea canal project aims to save the Dead Sea by siphoning off at least 2.5 billion cubic metres (cu. m) of water from the Red Sea and pumping it to the Dead Sea. The Jordan National Red Sea Water Development Project (JRSP) aims to address the country’s chronic potable water shortage by pumping water from the Red Sea through pipelines to a yet-to-be-built nuclear-run desalination plant that will produce some 700 million cu. m of drinking water a year when fully operational. There is some overlap between the two projects as both require water to be pumped out of the Red Sea. Experts say JRSP and the Red Sea-Dead Sea canal project can be carried out simultaneously. However, environmentalists are concerned that they could produce more problems than they alleviate. "You need to study the effect of taking out 2.5 billion cubic metres of water from the Red Sea annually [for the Red Sea-Dead Sea project] - which means 60 cu. m per second. Pumping this quantity of water will definitely affect the current of the Gulf of Aqaba and its coral reefs," Munqeth Mehyar, chairman and co-director of Friends of the Earth Middle East (FoEME), said. He warned of the negative impacts that could result from mixing marine water from the Red Sea with the Dead Sea water, known to be rich in minerals. 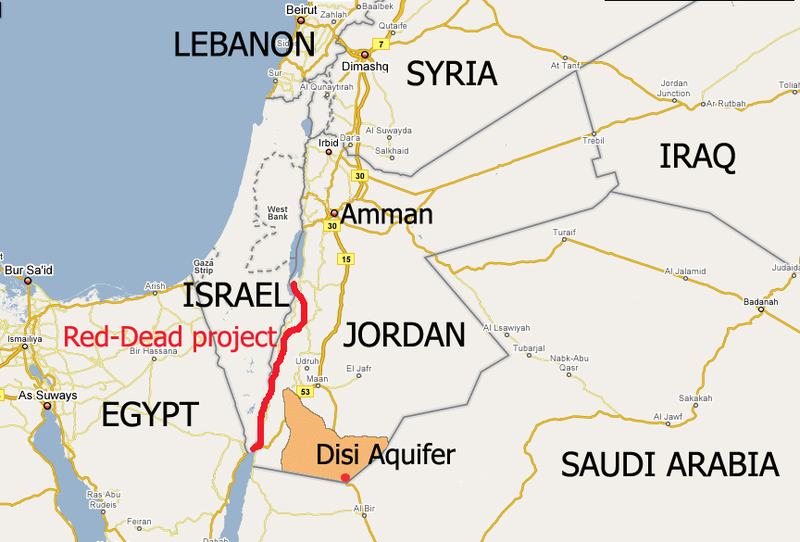 A map of Jordan and the surrounding region highlighting Desi Aquifer and the Red-Dead project. Où trouver de nouvelles sources d’eau ? The Dead Sea is considered the lowest point on earth - about 400 metres below sea level. Its water is 10 times more saline than ocean water, and its distinctive chemical composition and fresh/salt water interface have created a unique ecology of international importance. But the Dead Sea and its environment are changing as a result of a sharp decrease in water inflow from the River Jordan, which has been increasingly diverted for agricultural and industrial use. Recent figures from the Ministry of Water and Irrigation show that inflows to the Dead Sea are just 10 percent of what they were in the 1960s. The Dead Sea has lost more than one third of its water surface in the past few decades due to evaporation and industrial use, according to the World Bank. Its water level is dropping by nearly a metre a year, a rate at which scientists say it could dry up within the next 50 years if action is not taken. 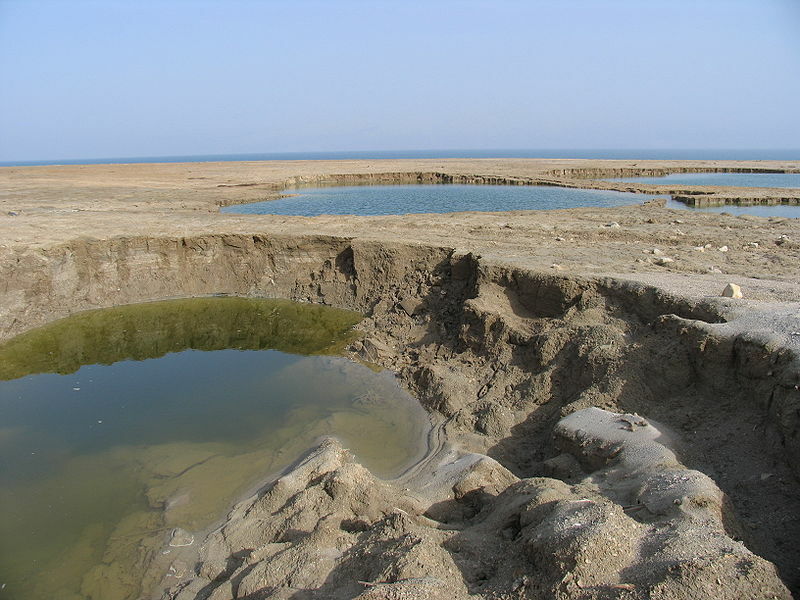 The declining water level has far-reaching environmental, social and economic consequences for the Dead Sea region and beyond. The response has been the Red Sea-Dead Sea project proposal which consists of a 250km canal or pipe extended from the port city of Aqaba in Jordan through the Wadi Araba area to the southern Dead Sea, costing US$12 billion. A World Bank-funded environmental impact assessment of the Red Sea-Dead Sea project is currently under way. The Jordanian government has said it will go ahead with the project to save the Dead Sea, whatever the cost. However, because of delayed international aid to kick-start it, the government wants to begin with the JRSP project to pump water from the Red Sea through pipelines, for desalination. "We took a small part of the Red Sea-Dead Sea canal project and decided to start with a desalination project as soon as possible because Jordan is facing a serious water problem and we must provide an urgent solution to our plight," Fayez Batayneh, director of the Red Sea-Dead Sea canal project at Jordan’s Water and Irrigation Ministry, said. Announced in May, JRSP will be undertaken by private companies with the support of the Jordanian Ministry of Water and Irrigation and the Jordanian Atomic Energy Commission. It will be built in five phases needing 25-30 years to complete. Water generated by the plant will be delivered to the Aqaba area initially and eventually to the capital, Amman. Brine from the desalination process will be discharged in the Dead Sea, helping to limit its decline. Water and Irrigation Ministry officials said chemicals used in the desalination process would be neutralized before being released into the sea. Environmentalists such as FoEME chairman Mehyar have warned of the environmental impact of the JRSP desalination project. "This project is not environmentally friendly. Pumping this amount of water requires one of the largest pumping stations in the world. It would be run by nuclear energy or a specially constructed electric station. This will lead to increased emissions," said Mehyar. Some environmentalists have urged the government to look into alternative methods to saving the Dead Sea. Jordanian Environment Society (JES) President Mohammad Masalha said reducing the amount of water pumped out of the River Jordan, which flows into the Dead Sea, could help save the Dead Sea. But government officials said it was difficult to persuade Israel and Syria to reduce the amounts of water they pump out of the River Jordan. Batayneh, director of the Red Sea-Dead Sea canal project, said there was no other alternative but to go ahead. He said two studies were being conducted by French and English companies to "determine the most appropriate economic, environmental and technical methods to go ahead with the project”. Mehyar and Batayheh said aborting the project would lead to an environmental and human catastrophe. They said there were an increasing number of sink holes in the southern shores of the Dead Sea as a result of shrinking water levels. Sink holes are natural depressions in the land’s surface caused by the removal of underlying soil or bedrock by water. Varying in size from less than a metre to several hundred metres in diametre and depth, they swallow up whatever was resting on them previously. Dozens of farmers and their families have had to be evacuated from areas close to the Dead Sea after an increasing number of sink holes appeared, some five meters wide and equally deep. There are around 800 sink holes on the Jordanian side of the Dead Sea that have appeared over the past decade and nearly 1,200 on the Israeli and Palestinian side. "A lot of farmland is being abandoned. Farms are being destroyed. Even houses and factories have been evacuated because of the sink holes," said Mehyar.